This past week wasn't one for the record books but we did manage to put a good few in the net. We received a good amount of rain early in the week, close to 3 inches! Water conditions on the Bony, Petite and Grand we high and stained for the first part of the week but started to clear towards the end. As conditions improved so did the fishing, by Thursday we began to do very well again. 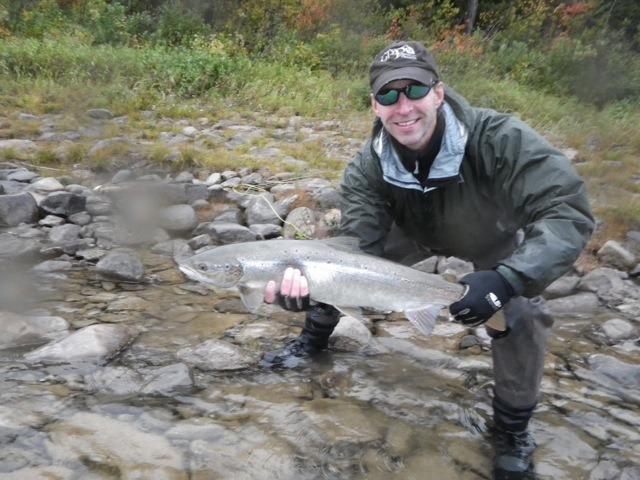 Jay Wadsworth with his first Atlantic salmon, nice Jay, Congradulations! Late season fly's were still the best choice, the Red Francis, Alley Shrimp, Purple Slime and mostly all marabou patterns worked well. The high and stained water put the end to our dry fly season. 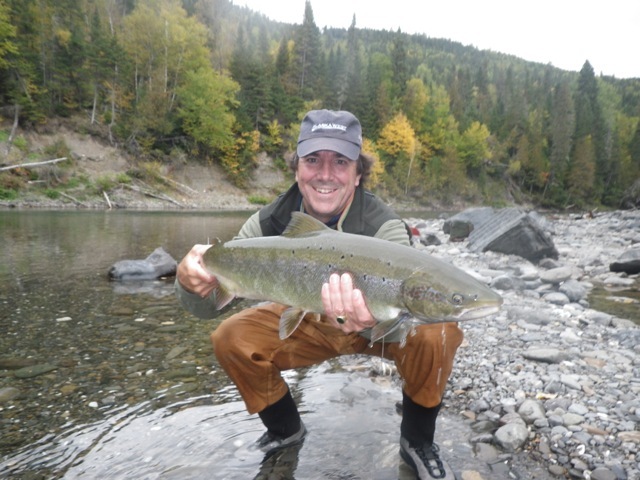 Rob Wadsworth just about to release a fine Bonaventure salmon, way to go Rob! Another season has come and gone, it just seems like yesterday we were putting our freshly painted canoes in the river. Today I can hear the motor from high pressure hose as we wash them all out for winter storage. Time passes quickly and before we know it we'll be taking the boats out again. 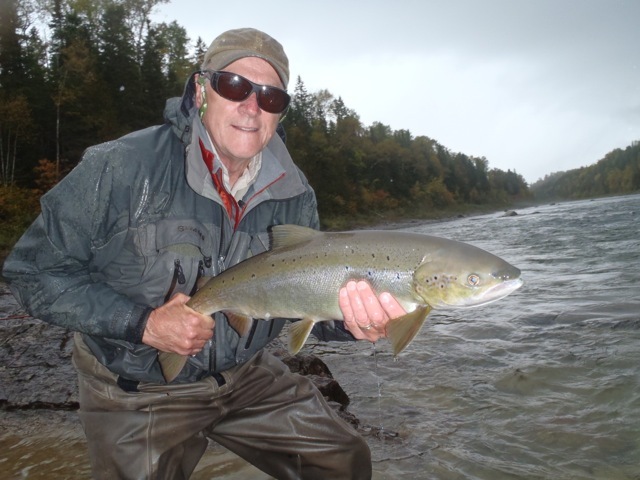 Ernie McFadzen with a nice september fish, nice Ernie! 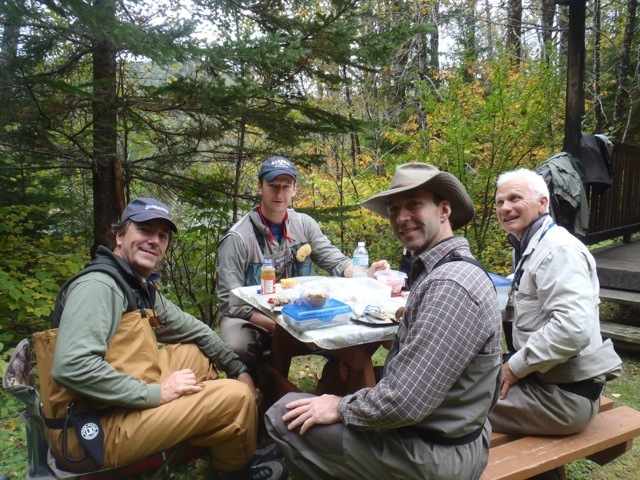 For those of you who haven't yet booked your dates for 2014 we still have a number of great openings both at Camp Bonaventure and at Salmon Lodge. If one of our Spey schools interest you we still have a couple of places available as well. In the off season I'm in the office Monday through Friday, give me a shout or send me an e-mail if you have any questions or would like additional information about our lodges and fishing opportunities. My toll free is 800 737 2740. A mid day river side lunch give you the fuel you need for the afternoons fish. To all our clients, who we now call friends, thank you for another great year. See you in 2014!